This action is used to upload one or more files using the chosen connection. Before running this action, you may want to use a FTP Change Directory action to change the remote directory. Specify the local directory where the files which you want to upload are located. If you specify a filespec, then setting the recursive option will find any matching files in any subdirectories of the Local Directory. The files will be placed into the correct subdirectories on the FTP server. Subdirectories on the server will be created if required. 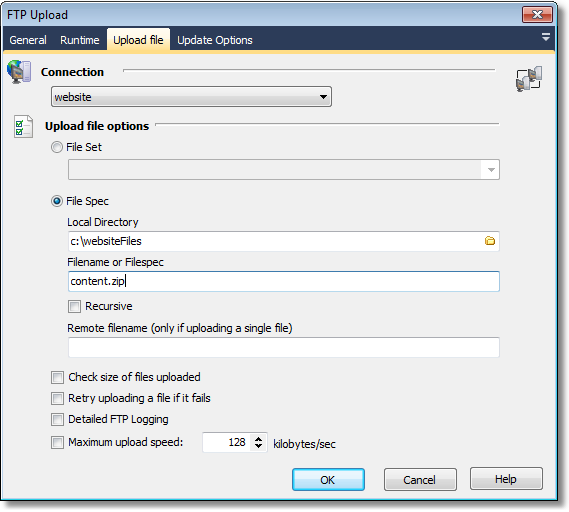 If you are uploading a single file, then you can change the name of the uploaded file on the server. This option will attempt to check the size of the file uploaded against the size of the original file and fail if the size differs. This option doesn't work with all FTP servers. Outputs the raw FTP commands and log messages to the log. You can choose a maximum speed in (in kilobytes per second) to throttle the upload. This allows you to conserve bandwidth for other applications. The upload will be aborted, and the action will fail, if the transfer has not completed within this timeframe. If you check this box, only files which differ from the versions on the server will be uploaded. • Are newer than the copy of the file on the server. Note that not all FTP Servers support this option. The FTP Server must be able to return reliable time/date and file size information in order to use the Update Only feature. In cases where timezones are set incorrectly, or the FTP server does not use UTC, clock skew may be several hours. 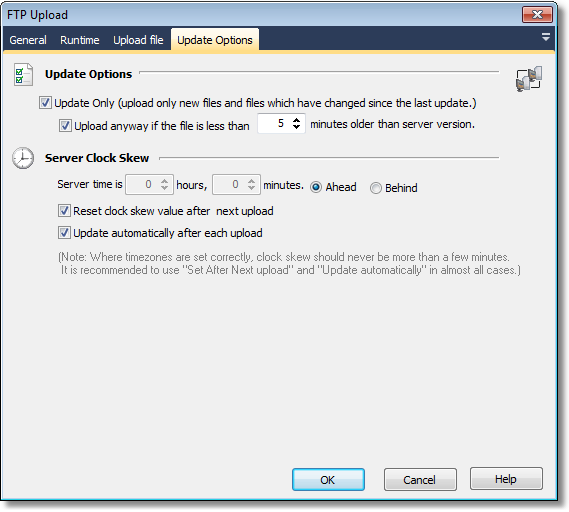 It is generally recommended that you do not edit the clock skew value manually, but rely on the "Reset clock skew value after next upload" and "Update automatically after each upload" options to set it automatically. 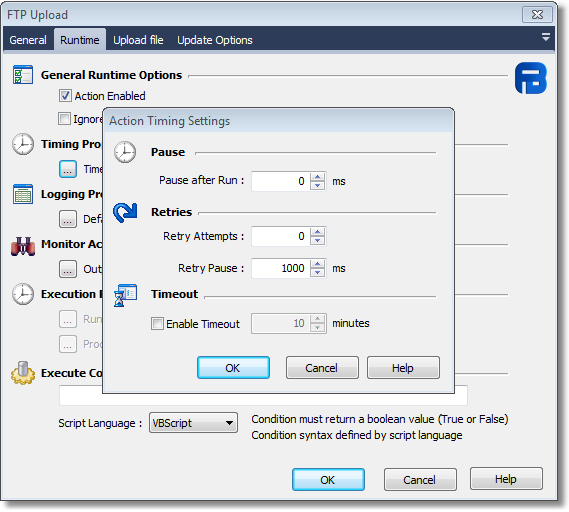 It is recommended that this option is set the first time the action is used, and any time there is a possibility that the FTP Server or local computer's timezone information might have changed. If this option is checked, then each time a file is updated its timestamp is used to reset the clock skew value if it has changed. This helps overcome "clock drift" over time.